Today marks the first Monday morning in a couple of months that I haven’t been teaching. I had gotten into the ritual of beginning each class with little weird and interesting tidbits about contemporary France, stories about everything from the decline of the noble snail to an experiment with social media among a select group of homeless Frenchmen. I found that these little tidbits got everyone (especially me) loosened up and ready to sit for a deeper dive into a topic like, oh, I don’t know…the French Second Empire. I also realized that by structuring the class this way, I was sort of thinking like a magazine geek — short departments in the front, long reads in the middle, a punchy closing note that set up for the next issue, er, I mean, class. So I wanted to take a similar approach with my web site, at least for now. My picks won’t necessarily be France-related all the time, but there will be a decent diet of Franco-reads. You’ll also get a taste of the eclectic lifestyle pieces and features that tend to catch my eye. Here’s hoping they give you something fun or interesting to read while you sit with your morning cup of coffee or take a lunch break. The Found Art of Thank-You Notes (Nytimes.com) I used to hate writing thank you notes when I was a little kid, but my family stressed the importance of showing gratitude for gifts both large and small. Now I find that I’m trying to fight the ease of dashing off an email or text to show thanks, and instead buying nice stationery so I can stick with this old school — and much more personal — art. The New York Times published a feature recently about thank you notes, saying that “the boring stuff your parents made you do never actually goes out of fashion and that also inadvertently supports recent scientific findings linking gratitude to increased optimism, stress reduction and a better night’s sleep. Few who sit down to write a bread-and-butter note are likely to be aware that by doing so they are not only on trend but also on their way to becoming happier and more sociable people. Apparently, what Emily Post termed good manners (science prefers “gratitude intervention”) has all kinds of unexpected benefits. 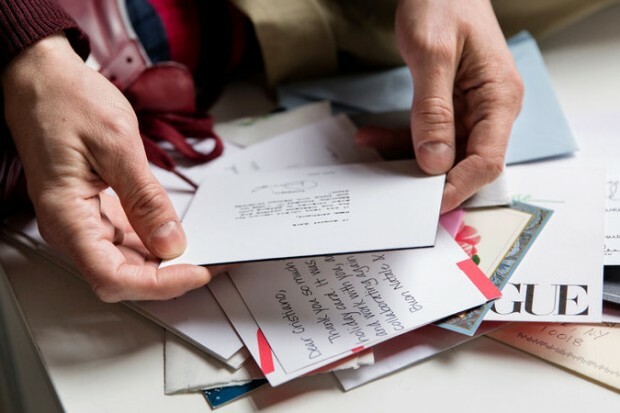 And as it happens, the handwritten gratitude intervention seems to be experiencing a moment of vogue.” Taking the time to find the special papers, and the right pen and best words shows “gives material evidence that the person really did appreciate something.” Are you a thank you note writer? If so, why do you choose this old school approach? If not, why do you think it’s fuddy-duddy? Do you prefer your thank yous digitally or by snail mail? How To Dress Like a French It Girl (elle.com) Merci, Elle Magazine for breaking down French style for the rest of us. The magazine takes 11 icons, breaks down their style, piece by piece (and price by price), ultimately giving you an accessible way to look tres magnifique. Some of my favorite looks: Jean Seberg, Ines de la Fressange, Farida Kelfa and Lou Doillon. Will Ortiz’s Selfie Be Obama’s Last (boston.com) Where to begin about the Red Sox? After the Orioles (my Orioles) beat them on Opening Day last week, the Bosox emerged true to form and began making mincemeat of the Birds’ pitching staff. In the midst of all this, they took the standard post-championship trip the White House and presented President Obama with a Red Sox jersey. Designated hitter David Ortiz took a selfie with the president, but that caused a stir because Ortiz is on Samsung’s payroll as a “social media insider.” Said White House senior advisor Dan Pfeiffer: “In general, whenever someone tries to use the president’s likeness to promote a product, that’s a problem with the White House Counsel.” Ortiz said the picture had nothing to do with any deals. He was just caught up in the moment and wanted to take a shot while he had the chance. Paul Stanley dishes on KISS feuds and painful secrets (cbsnews.com) KISS guitarist Paul Stanley has a new memoir out and I think I need to get it for my hair band-loving sister. His band just got into the Rock ‘n’ Roll Hall of Fame, which he feels is more of a slap in the face than an honor. “The Rock N’ Roll Hall of Fame is fluff,” he told CBS. “It’s a farce. It’s like an Addams Family bar mitzvah. I’m gonna go, but let’s not kid ourselves, you know. That’s not the Rock n’ Roll Hall of Fame. The Rock n’ Roll Hall of Fame is walking the streets…We are the bitter pill that they ultimately had to swallow. Because they don’t like us. And the only reason they’re inducting us is because they begin to look foolish at some point for not having us in.” Rock on, man. And read on, y’all.